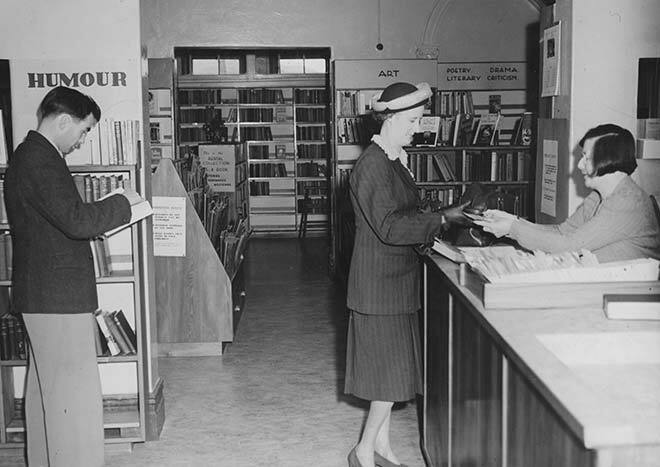 In 1949 Petone Municipal Library switched from a subscription system, under which members had to pay regular subscription fees, to a 'free and rental' system. Subscription fees were abolished and members paid to take out only certain books, while most were free to borrow. This is Mrs Poole of Days Bay borrowing books under the new system. She is served by librarian S. Calvert. Another librarian, C. Tolley, stands to the left of Mrs Poole.